Creating Facebook Covers has been around for awhile in the Create Panel in the Organizer; however, the first efforts by Adobe were limiting and a bit clumsy. You had to struggle with a limited set of templates to simply add a background photo and a profile picture without any default text. 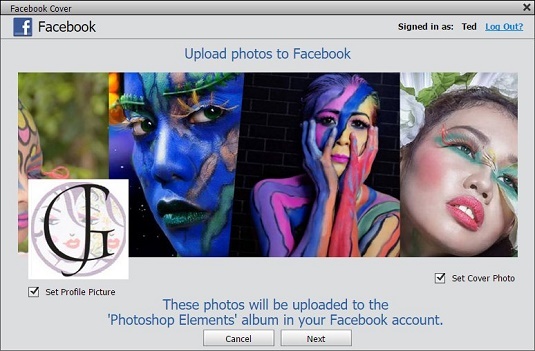 Now in Elements 15 Adobe has provided you with several new templates to help you create just the right Facebook Cover you want. A new list of templates appears in the Template Category. Click the Upload button to upload to Facebook. Select photos in the Organizer. 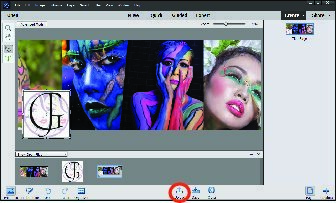 The Facebook cover option appears only in the Organizer’s Create panel; hence; you need to select your images in the Organizer first. Open the Create Panel and choose Facebook Cover. The Facebook Cover window opens. The minute you choose Facebook Cover in the Organizer you are switched to the Photo Editor. The Facebook Cover Wizard opens. Click a theme and decide whether you want to use a single photo or multiple photos by clicking the corresponding theme category. Edit the images for position and size. Click the green check mark when you have the image(s) sized to your liking. If you want, click the Save button to save the file as a .pse file that you can reopen and rework if you change your mind. Click the Upload button when finished. You arrive at the Upload Photos to Facebook window. The window shows you a preview of how your new cover will appear. If you like what you see, click the Next button and follow the steps to upload the images to your Facebook account. Choose a theme for your Facebook cover image.